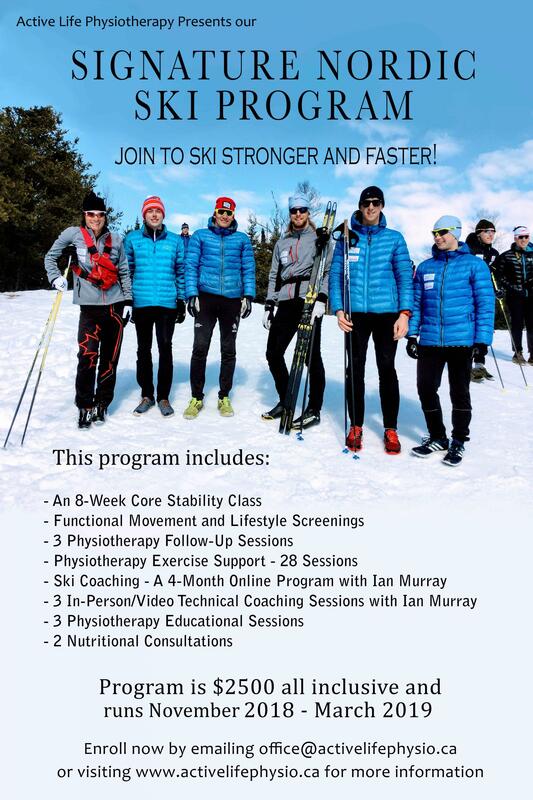 Join to Ski Stronger and Faster! Program is $2500 all inclusive and runs November 2018 - March 2019. Register Here or email office@activelifephysio.ca to reserve your spot. A four-week program where you can receive the physiotherapy support you need! Have you been prescribed physiotherapy exercises by a health care professional? Do you wonder if you're doing your exercises the 'right' way? Are you looking for a supportive atmosphere to exercise in? If so, these sessions are for you! Registered Physiotherapist, Jenna Nodding, will lead you in your rehabilitation program and provide any necessary hands-on care, tailoring exercises to just for you. Each Session will have a maximum size of 8 participants so you can be sure that you will be getting the focused attention you need. The program consists of sessions that are one hour each, offered in monthly blocks for a total of 8 sessions a month, allowing you ample time to establish new, healthy movement patterns in your body. Do you have sore joints and find it difficult to get around or exercise? Would you like to learn to manage your weight without fad diets? Would you like increase your energy? If you answered yes to these questions then this program may be for you. Work with an expert team, including a physiotherapist and registered dietitian, to reach your health and wellness goals. Your physiotherapist will design a safe and effective exercise program just for you aimed at increasing your mobility, strength and exercise tolerance. Your dietitian will create a nutritional plan just for you to help you reach your health and wellness goals. *Research shows that a combination of physical activity and diet provide superior results in weight loss management. One hour consultation with registered dietitian. One hour individualized physical assessment with registered physical therapist. One-hour lifestyle coaching and consultation session with registered physical therapist. Weekly follow up visits with registered dietitian or physical therapist. Individualized nutrition program and coaching. Physical therapy coaching support to help you reach success with your exercise and wellness program. Online coaching tools to guide you to success. Graduation gift upon completion of your program. Watch here for new classes as they are posted and also on our Facebook page!